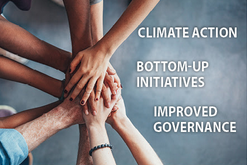 The shift towards a low-carbon and climate-resilient economy has been driven largely by bottom-up initiatives led by citizens, innovative businesses and various civil society stakeholders, as well as by local and regional authorities, collectively referred to as non-state and sub-national actors. In recent years, the number, scope and scale of non-state climate actions has grown rapidly. However, non-state actors still encounter obstacles that make it difficult for them to initiate and implement their climate actions successfully. The event will take the form of a regional Talanoa dialogue, designed to take stock of the collective efforts of Parties to the Paris Agreement on Climate Change, and will include both plenary sessions and participatory workshops focusing on turning the dialogue into an actionable agenda. It will bring together experts from national and subnational governments, the private sector, financial institutions and leading international and civil society organisations. A draft programme and registration form will be available soon. For any questions, please email ue.ap1556232748orue.1556232748csee@1556232748yrota1556232748vresb1556232748ods1556232748.